The boxed/shipping version will be delivered on an external 320GB USB hard drive for fast and easy installation! From ACADEMY AWARD, C.A.S. (Cinema Audio Society), BAFTA, and EMMY award-winning sound engineer SHAWN MURPHY, who has recorded and mixed the scores for more than 300 feature films including Indiana Jones and the Kingdom of the Crystal Skull, Star Wars: Episode II - Attack of the Clones, Star Wars: Episode III - Revenge of the Sith, Star Wars: A Musical Journey, Jurassic Park, Jurassic Park The Lost World, Harry Potter and the Prisoner of Azkaban, Titanic, etc. 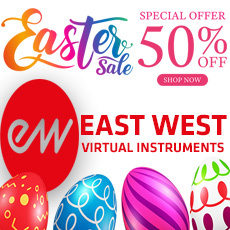 ; and multiple award-winning EASTWEST/QUANTUM LEAP virtual (software) instrument producers DOUG ROGERS and NICK PHOENIX; and composer and orchestrator THOMAS BERGERSEN, HOLLYWOOD ORCHESTRA is the culmination of over five years of recording, editing, and programming of 24-bit orchestral instruments, offering unprecedented control over each instrument, and is a must have compositional tool for serious composers. 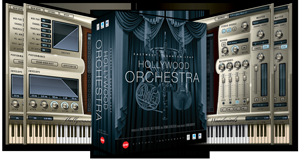 Recording for HOLLYWOOD ORCHESTRA took place at the famous EASTWEST STUDIO 1, the same studio where many Hollywood soundtracks and television themes were recorded with a live orchestra. Just great sounds overall. Woodwinds and especially Double reeds should be reworked IMHO to match the sound quality of the other sections.